At Boyle Eye Specialists, PC, we believe strongly in giving back to the community and caring for the eyes of all those in need. Outreach programs represent an opportunity to show the community the level of commitment our optometrists have to their community. The staff also plays an important role in community outreach. Our office participates in the old eyeglasses donation program for Lions Club as well as other charitable services. Standard recycling in the USA does not recycle the whole blister pack. Our recycling services recycles the entire blister pack. Bausch & Lomb have partnered with TerraCycle to create a free recycling program that wil recycle ALL brands of blister packs, including Vistakon, Alon, Coopervision and any other company blister pack besides their own Bausch & Lomb blister packs. We would like to encourage our patients to drop off their used blister packs in our BioTrue recycling box. This disposable soft contact lens (SCL) recycle program was launched by Bausch & Lomb, the BioTrue OneDay and Ultra SCL vendor. The disposable SCL blister packs that contain the SCLs are made of a plastic body with a peel away foil top. In the USA even if you place the used blister packs in our Recycle garbage cans, these blister packs are not recycled. They are normally separated out and go to the garbage dumps. Bausch & Lomb has partnered with Teracycle to recycle these blister packs. Bausch & Lomb and Teracycle will recycle ALL Brands of foil packs. They will recycle Vistakon, Alcon, Coopervision and any company’s blister pack in addition to their own Bausch & Lomb blister packs. Visit our eye care clinic in Scranton, Pennsylvania with your blister packs from disposable contact lenses, and we’ll keep our environment clean together. 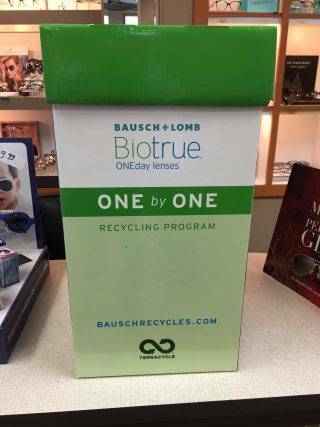 What is the Bausch & Lomb ONE by ONE Recycling Program? Why can't I recycle my contact lenses with my other plastic/recyclable items? 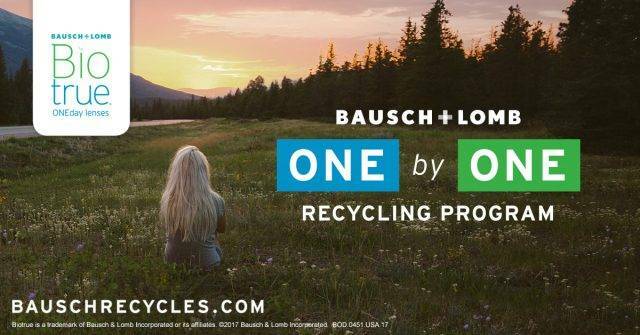 Participating in the Bausch + Lomb ONE by ONE Recycling Program benefits our environment by reducing the amount of waste deposited to landfills across the country. As a thank you for your dedication, a $1 donation will be made to Optometry Giving Sight for every pound of accepted packaging sent through this program.